Evergreen Agriculture is a form of more intensive farming that integrates trees into crop and livestock production systems at the field, farm, and landscape scales. These systems feature both perennial and annual species (trees and food crops), thus sustaining a green cover on the land all year round, while increasing crop, fodder, and fuel wood production. EverGreen Agriculture systems involving nitrogen fixing trees – ‘fertilizer trees’, provide fertilizer and organic resources use efficiency for greater crop productivity. These systems are fully compatible with the use of improved crop varieties, crop rotations and crop diversity, and enable reduced tillage, increased residue retention on the soil surface, and other principles of conservation agriculture, in many situations where these practices are feasible and appropriate. EverGreen Agriculture broadens the principle of crop rotations to encompass other cash crop trees to provide needed biological and income diversity in the farm system. In this respect, the types of intercropped trees may include species whose primary purpose is to provide products or benefits other than soil fertility replenishment alone, such as fodder, fruits, timber, and fuel wood. 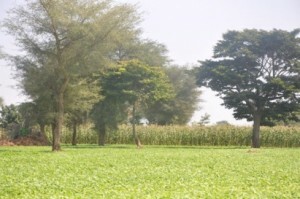 In such cases, the trees provide a value greater than that of the annual crop that would have been obtained from the land area occupied by the trees.